One of four prefectures of Crete is Rethymno, just in between the prefectures of Chania and Heraklion with the Cretan sea in the north and the Libyan sea in the south. The city of Rethymnon (about 30 000 inhabitants) central part is built on the cape of the northern shore of the prefecture. The sandy beach has a total length of 15 km. Along the beach you find the resorts Perivolia, Platanes, Adele and Stavromenos and it´s easy to reach Rethymno by bus. Bus timetable! There are also excellent connections by bus to Chania and Heraklion. An enjoyable route is to take the ferry from Piraeus to Heraklion or Chania and from there by bus. From Chania, direct bus from the ferry location to Rethymno. If you come by plane to Iraklion or Chaina is about an hour busride to Rethymno from the buststations, the buses run once an hour and the last bus leaves 22.30 in summer. From the bus station in Rethymno is a few minutes walk into the old town. 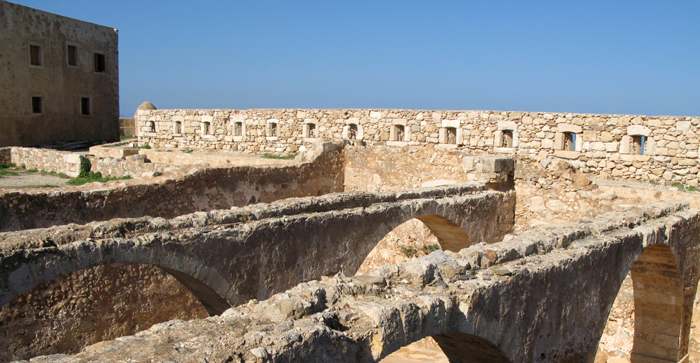 Rethymno is a living city, even in winter, thanks largely to the university which was founded in 1974. Rethymno have one of Crete's finest sandy beaches that extends from the Venetian port and 20 km to the east. Here are the resorts Perivolia, Missiria, Adele and Stavromenos from which one can easily take the bus to Rethymno. By car or bus you can reach the beaches a bit west of the town, towards Georgoupolis, the beaches are lovely and there are more space between the chairs and towels. Episkopi beach is a favorite for many. The Rethymno-provinse has a very diverse nature with mountains, gorges, caves, valleys and rivers which provide great opportunities to experience nature if you get tired of the busy city life. Exept from beautiful and changing natur there are a large number of sites of archaeological importance, historical sites, churches and monasteries in the Rethymno-provins. Besides from enjoying the city life, shopping and dining, don´t forget to look out for some of the famous buildings that will tell you a great deal of the towns history. Fortezza Frourio. Built between 1573 and 1587 after the Turks attack in 1571. In 1646 the turkish troops once again arrived under the command of Hussein Pasha. After just 30 days the Governor of Rethymno negotiated the capitulation of the city. You will find the Sultan Ibrahim Mosque in the middle of the fortezza. The Archaeological Museum is housed in front of the central gate of the Fortezza. The findings are exhibited in archaelogical order from the Minoan, Hellenic and Roman periods. Historical and Folklore Museum (28-30 Vernardou street) was founded in 1973. Great collection of folklore material, such as hand-woven textiles, embroideries, ceramics, costumes and much more from the Rethymno-area. 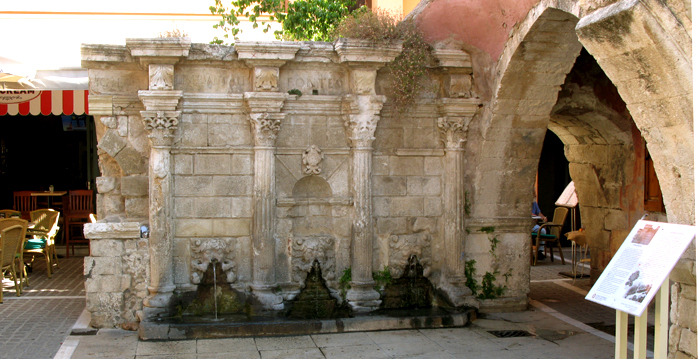 Rimondi Fountain built in 1626 and situated at Platanos Square (Platia Petychaki). In the shape of three lion´s head, the water runs into three sinks. Mosque Tis Nerantzes with it´s three domes and a large minaret is situated just in the middle of the old town. Today it is used as a music school named Odeion. Mosque Kara Muza Pascha at the corner of Arkadiou and Viktorus Ougo was by the Turks turned into a mosque. Around the temple you will find many Turkish gravestones, "mezaria". Platia Tesseron Martiron close by the municipal garden. Here you find the new church and a statue of Kostis Giamboudakis (he became a symbol of self-sacrifice and freedom during the revolution 1866-1869). 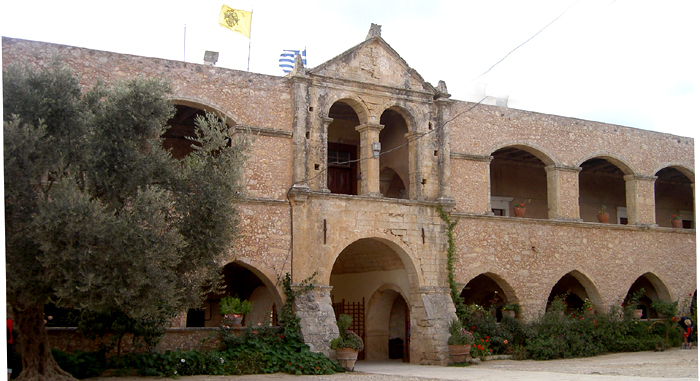 Arkadi Monastery is located 24 km from Rethymno and is built during the Venetian period and named after the monk Arkadios according to scientists. Tradition says otherwise, which would mean that the monastery is named after the emperor Arkadios. 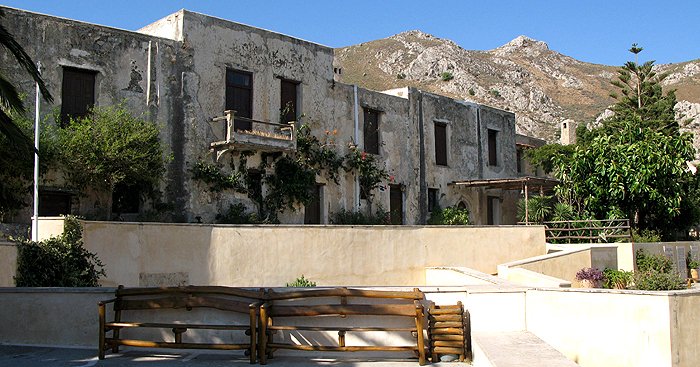 Monastery of Preveli played an important role during the Second World War as a hub and information center. Even for medical care. If you imagine a trip to the Preveliarea please visit the old monastery which is powerful even today, before going into the field, you will get your assigned clothing that covers shoulders and knees if you have not already approved clothes on you. Agia Galini is 58 km south of Rethymnon and is now a popular resort with clean beaches in small coves around Rethymnon. Anogia, Zoniana, Livadia and Margarites in the province of Milopotamos area and is known to keep craft alive traditions. Here are ceramics, stone cutting, wood carving, weaving and wickerwork. The Marathi caves Daily with Dolphin Cruises from the Venetian harbour. Information and reservations: +30 28310 57666. One day cruise to Santorini with United Cruises. Departures every Thursday and Saturday at 7.30 am. The Renaissance festival since 1987. During the festival many performances are held at the Erofili theater on the Fortezza. The treasure hunt, a one day game about the history of Rethymno. It takes place two weeks before the carnival. The carnival in Rethymno since 1915, the biggest carnival on the island of Crete and the carnival has been every year since 1959. The carnivals day is alvays Sunday 50 days before Easter Day and it will be 13 March 2016. Easter Day is 1 of May. The wine festival every summer in July. Visitors are given the opportunity to try almost all the varieties of the Cretan wines for free. You have to pay a few Euro fee to enter the city park. Bring your own glass! The Happy Walker offers 6 different hikings through the inland parts of the island along stony mountain paths and down to riverbeds. You find the office at 56 Tobazi, telephone: +30 28310 52920. Crete is a perfect island for watersports, above or under the sealevel. Scuba diving is a fast growing activity that is also available in the area of Rethymno. Most dive centers offer their activities on the north coast of Crete, since here is the concentration of tourism. There is however the Kalypso Rocks Palace Diving Center that transfers their guest to the better south coast of Crete. Near the village Plakias, which lies directly opposite the town Rethymno is the base of the diving center. Here in crystal clear water not disturbed from swimmers and boats beginners and experienced divers can join snorkeling and introduction programs for people from 10 years of age. Divers holding a certificate may go on guided dives from the shore or the boat. Join a day full of new experiences and discover Crete underwater. Christmas is of course a big holiday and on the 6 of January "Epiphany" is celebrated in the ports. The priests bless the sea by throwing the Holy Cross into the water and divers jump into the sea competing in order to find the cross. Easter is the biggest holiday and begins one week (Holy Week) before Easter Sunday. During Easter you really feel the religous belief of the people. On Easter Sunday there are barbecues all over the country-side to celebrate the resurrection of Christ and that spring has arrived. Another big holiday is on the 15 of August to celebrate the assumption of the Virgin. You have to buy your ticket before you enter the local bus. You can buy the tickets from the kiosks in Rethymno and outside from the super market. (Hotel or Panormo is the bus to the hotels along the beach). When you enter the bus, hold your ticket and the chauffeur will tear half of it. The bus use to stop at every bus stop but to be sure, stand up to show that you will go off. The ticket to Misiria costs around 1,5 Euro and to Adele 2 Euro. During the tourist season the bus leaves every half hour. If you want to go with the main road buses you can buy the tickets onboard the bus or at the bus station. Taxi is not very expensive, but we can´t give any prises. You have to be prepared that the driver can pick up more passengers and the both parties pay as it was "your own taxi". There are taxi stations at Iron Sq and Megali Porta. You can also just wave when you see a taxi in the street and it will stop and pick you up. The saying goes that the secret behind the long life span of Crete people is olives and olive oil. People eat wild vegetables as salad or boiled with local olive oil on top. Skordopsomi - Garlic bread & cheese from sheep. Tzatziki - Yoghurt, cucumber, garlic. Melitzana - Crushed aubergins, herbs, garlic. Dolmadakia - Wineleaf filld with rice. Favva - chickpea purée with fresh spice & garlic. Manitaria - Frizzled garlic and mushrooms, fresh basilika. Kalsounakia - Small pies with cheese. Garides Sachanaki - Scampi in hot tomato-sauce, fetacheese. Skordalia - Potatopurée with garlic. Mezedakia - Before dinner, small plate with different dishes.